This modern work, "The Quartet" tapestry is a modern piece by artist Jay Russell. Here we see a quartet of jazz musicians, the pianist, the saxophonist, the drummer and the bass player in a style of art seen in many modern and traditional jazz clubs. 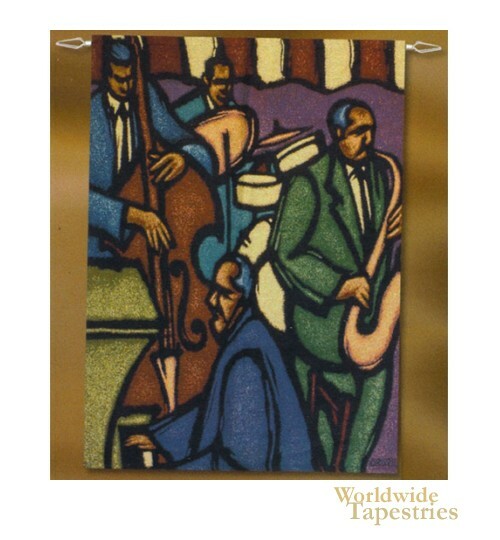 This contemporary musical tapestry "The Quartet" is backed with a lining and has a tunnel for easy hanging. Note: tapestry rod, where pictured, is not included in the price.